Audience targeting in SharePoint is a powerful tool, but it hasn’t always been easy or fast to configure. That’s been a challenge inside Microsoft, where it’s been a blocker for moving some of the company’s major internal portals to the modern SharePoint experience. Microsoft disclosed a new audience targeting capability for the modern SharePoint experience at Ignite 2018, around the same time the company started using it. The public release of the feature is coming soon for all customers. Audience targeting gets the right content to the right audiences—it personalizes your employees’ view of news and information, says Sam Crewdson, a senior program manager in Microsoft Core Services Engineering and Operations (CSEO). Microsoft uses SharePoint to run the big internal portals that support 230,000 employees and vendors, and it’s important to have the portals be personalized and relevant. For example, Microsoft uses audience targeting on its primary company portal, MSW. Crewdson says SharePoint Online’s recently launched modern experience is an upgrade over the SharePoint Online classic experience, which replicated the old on-premises version of SharePoint and didn’t have as many new features and capabilities as the product team wanted. Modern SharePoint experiences give end users powerful, accessible, mobile-ready sites with a minimum of custom development needed. The Microsoft SharePoint product team has been working hard to evolve SharePoint over the past few years, he says. As a result, the adoption rate of these new, modern sites at Microsoft has been high—nearly 75 percent have already transitioned to modern. Those that didn’t move quickly cited the lack of audience targeting as a blocker. In 2017, Crewdson, who is responsible for mapping out how to move the company’s internal portals to modern (which began with moving most sites and portals into Office 365), and Dave Cohen, the product team program manager responsible for modernizing the overall SharePoint publishing system, talked candidly about what it would take to move major sites like MSW from the classic publishing infrastructure to the modern experience. Since then, the product group, CSEO, and the managers of the company’s intranet portals have worked together to prioritize, test, and deliver many of the features Crewdson and Cohen discussed (with more to come). “With audience targeting and all the other new SharePoint features, we feel like we are now ready as an enterprise to move our most important internal sites to modern,” Crewdson says. Microsoft intranet site owners began as early adopters, using the new targeting capability back in September 2018. It took just a few clicks. And specialized help was often needed. 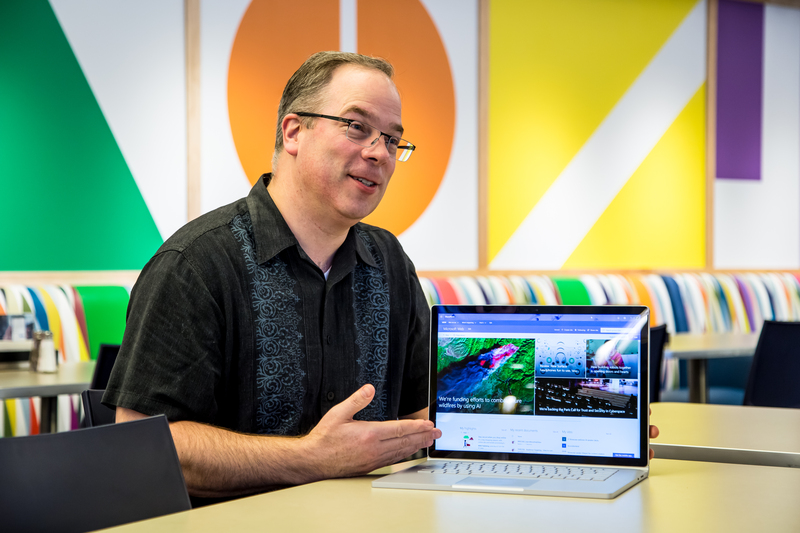 “When owners of our larger, company-wide portals wanted to surface content that was relevant to an individual or group, location, or organization, they generally had to work with a SharePoint developer to make that happen,” he says. Things have changed quite a bit since then. Now, all you need to do to configure audience targeting is define the relevant Office 365 groups or security groups that should see your content and, boom, you’re off and running. Crewdson says the audience targeting will be a part of a few key, existing web parts and will be added into future web parts, page improvements, and other new features in SharePoint Online, including hub sites and mega menu navigation. “A demo makes it easy to see what you can do with audience targeting,” Crewdson says. He ran through an example of how someone could target news articles to individuals or groups—all managed in Azure Active Directory (AAD). Go to your Site Pages library, Library settings, Audience targeting settings, and select the Enable modern audience targeting checkbox. Then, in the audience column of the Site Pages library, select the group you want to target. Finally, add the News web part to the page and turn on Enable audience targeting. When the audience targeting feature is released publicly later this winter, site owners will be able to target Office 365 groups and security groups. When it comes to the teams that manage the many internal portals at Microsoft, the story gets better. Audience targeting is just one of many new features that are motivating portal owners to shift to modern. For more information on recent SharePoint innovation and the company’s adoption of modern intranet sites, take a look at this IT Showcase case study, Redefining the intranet site experience with SharePoint in Office 365. And keep an eye out on the SharePoint community blog to stay up to date—that’s where the company shares stories on new SharePoint features and capabilities.